Sigar Military Station organised Traditional Archery Competition at Pasighat. Second phase of Archery competition for the youths of Arunachal Pradesh was conducted by Sigar Military Station on 02 December 2018 at Gidi Notoko ground at Pasighat. 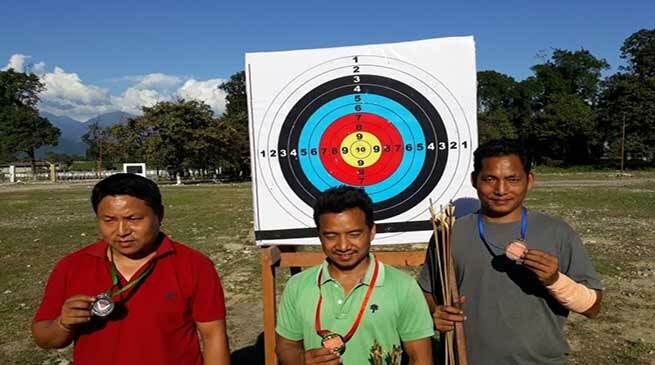 The first phase of competition was held in the fourth week of November 2018 for the young budding archers from Subansiri Valley, Siyom Valley and Siang Valley Twenty Five best archers, who qualified in the first phase of the competition, competed in the second phase to prove their mettle. The competition provided impetus in enlivening the interest of the local populace in this traditional art of archery. It provided the young budding talents a great opportunity to showcase their talent and provided them a platform to revive the traditional art of archery. Commander Sigar Military Station felicitated and conveyed his best wishes to the winners He encouraged the young archers to take up archery as a professional sport and bring laurels to the country. Gandhi Tatak of Rani village with 63 pts, Ruson Taggu of Rani village with 41 pts and Okeng Ering of Boying village with 35 pts adjudged 1st, 2nd and 3rd position respectively.